Has it been a year? It kind of has. It’s getting harder to take pictures of the kids. This year we headed to the tree lot early, because I am heading out of town for a while to visit my mom, who has been ill. Our son is now 12, and has glumly resigned himself to the prospect of having to go to the tree lot in the company of his parents and younger sister, which he finds embarrassing. Our daughter (now 8) is still delighted by the prospect of running around looking at the turkeys and running through hay bales, which I have come to appreciate because I now have evidence that it will not last forever. On arrival, however, both kids were charmed by the usual collection of things on offer that kind of freak me out: trees flocked in neon colors and inflatable snow globes. Their demands to get a flocked tree this year got them my usual public health killjoy response: “no toxic flame retardants in the house!” Ho, ho, ho. We are no longer the only people to ride to the lot, although I wouldn’t say that it is packed with bicycles. We are certainly no longer considered bizarre by the lot workers, who cheerfully heaved our tree into the bucket of the Bullitt, clearly pleased not to have to carry the tree out to the parking lot. However given that once again we ended up riding past a line of cars stretching back for two long blocks, it seems that most other people still haven’t figured out how much easier it is to ride. This remains one of the many household trips that I cannot fathom doing by car, because between the waiting to get into the lot and the strapping of the tree onto a car, the whole endeavor turns into a multi-hour process. We are not exactly decisive when it comes to picking out a tree, yet we still managed to ride away before some of the families waiting in cars had even reached the lot. That’s no way to live. Heading home by longtail bike, with two kids on the back whose legs are really too long to sit together anymore, followed by a front loader carrying a Christmas tree, well, it seems that this is still the kind of thing that stops traffic—at least what little car traffic was moving. The other bicycle riders on the street, though, just waved. We all know what’s possible. Like last year, our return home this year coincided with the return of our next door neighbor, also on his bicycle, from grocery shopping. The world is changing fast, in some scary ways, yet some things stay the same. Sometimes that’s all I can ask. Hey. Hey there. I’ve spent a crushing term with an extra-heavy teaching and advising load, and spent all of my writing time working on papers and grant proposals, because that’s my real job. However it’s now December, I’m done teaching and have mostly caught up on papers, and don’t have another grant proposal due until February. It’s blogging time! December has traditionally been the time of year that we head to the Christmas tree lot and draw stares as we load up a tree on our bicycle. Our son (11) is now old enough to be feeling some tween awkwardness at the prospect of rolling into the Christmas tree lot on bikes; our daughter (now 7) remains oblivious to all forms of peer pressure. Admittedly both kids express some interest in the question of what it might be like to carry a Christmas tree in car, as they have no memory of ever doing so. However when we arrived and discovered a long line of cars waiting to enter the parking lot (which we breezed past, per usual) our son concluded that our decision to bike was appropriate after all. And despite some unusual indecision from the kids this year about which tree to purchase and some contemplation of the (live) turkeys and rabbits, we still made it in and out of the lot faster than any of the drivers. In this, our sixth year of hauling a Christmas tree by bike, the people at the lot have gotten used to us and we no longer raise eyebrows. We’ve learned we can roll the bike right up to the tree baler, which makes us popular because it means no one needs to carry the tree anywhere, let alone strap it to a car roof. I know that other families in the neighborhood bike their trees home too; thus far we’ve never met any of them at the lot, though. We have pretty much settled on the Bullitt as our Christmas tree bike, after some experimentation in earlier years. Front loaders are laughably easy to load; just throw whatever in the bucket. Our tree was taller than we are, so we also used a couple of bungees to ensure it wouldn’t slide out on bumpy pavement. For this reason and many others, the Bullitt remains the most reliable vehicle we have ever owned. When we first began carrying our tree by bike, it got us a lot of attention. Even last year, we got a bit of hooting and dropped jaws. 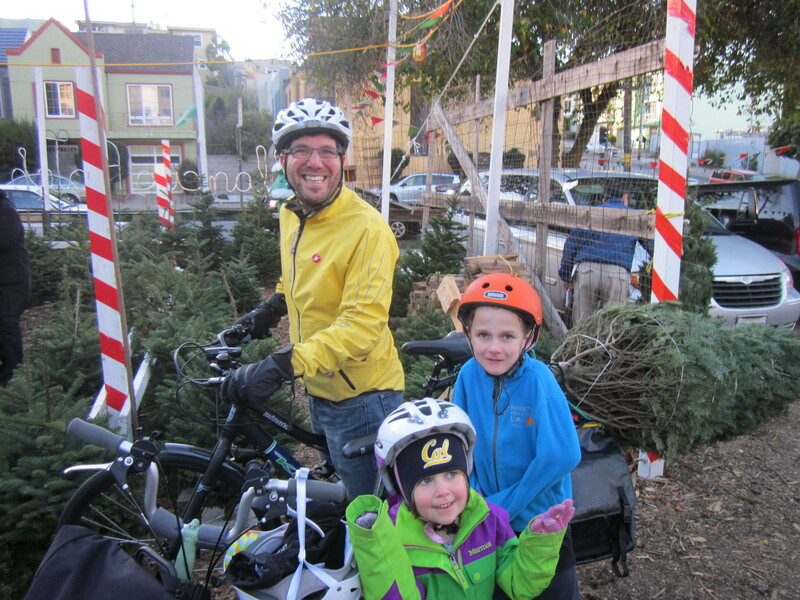 This year was the first time that no one seemed to think we were doing anything odd, riding bikes around San Francisco with a Christmas tree and two kids. We see more and more families like ours every year. As we rode up to our building, our next door neighbor appeared on his own bike, on his way back from a trip to the grocery store. It was cool. Not everything gets better all the time, but it feels like occasionally, some things do get better. We were having camera trouble at the lot, so this mug-shot is the best we’ve got. There was a time when we didn’t get a tree every year (because technically we’re a Jewish family, albeit a California-Jewish family affiliated with the Japanese-American community, so we celebrate holidays of the world on like a daily basis). However now that we go everywhere by bike, it’s an annual thing. And we’re getting better at it. This was the fourth year we went tree-shopping by bike, and every year the trees get taller, the loading time gets shorter, and the trip gets less precarious. 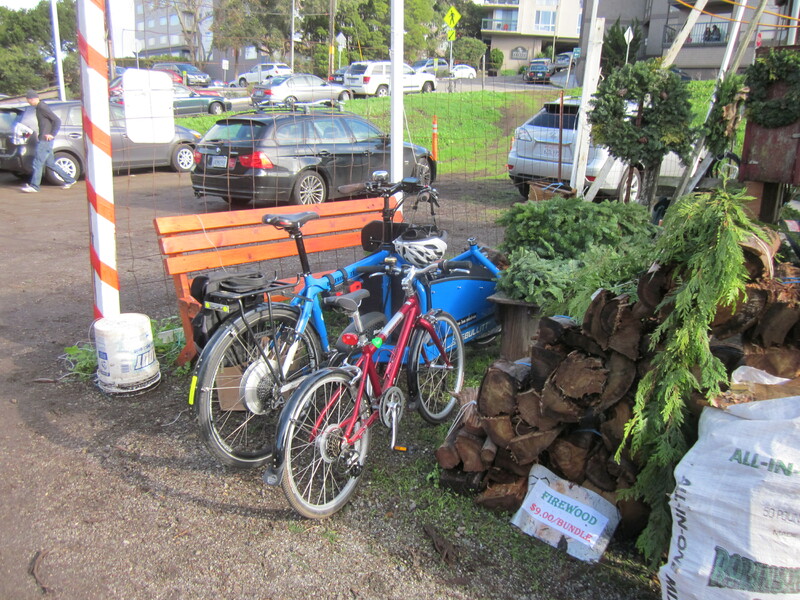 It’s easy to park cars at the Christmas tree lot, but it’s even easier to park bikes. 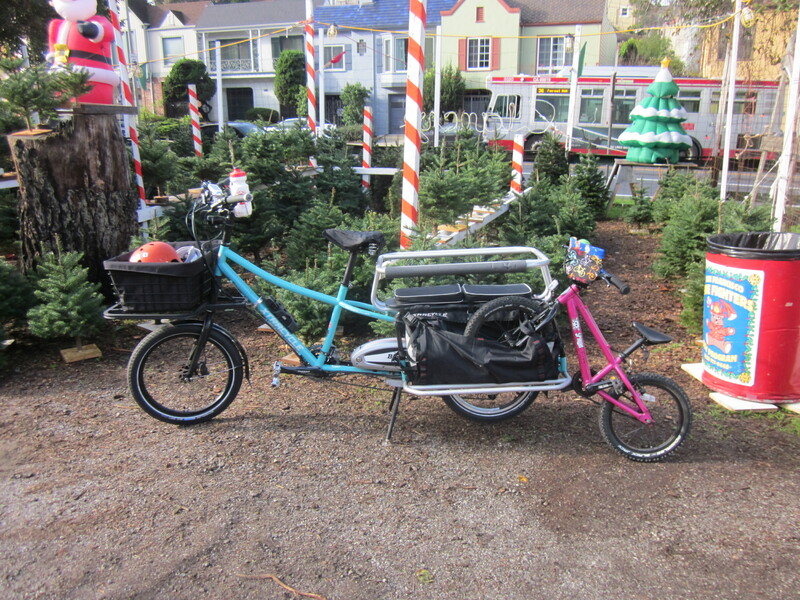 In the first year we picked up our tree by Kona MinUte, and in the second year we hauled the tree by Bullitt. We also forgot to take the cover off before leaving that year, and lost a critical part, so in year three we went back to the MinUte. And then this year we hauled by Bullitt again, remembering this time to take the cover off in advance. We’ve also moved since last year, so instead of going downhill then uphill again, it was all uphill on the way to the lot, and all downhill on the way back. We don’t normally ride on the sidewalk, but it made for a good photo. Our bugaboo has always been that we have the lot nail on a stand for the tree, which makes the tree wide as well as tall. This year we were enough of a caravan that we were already all over the lane. So we dumped the tree sideways on top of the Bullitt’s bucket, snapped a couple of bungees to the side pins to hold it in place, and rode on home. No problem. The big change this year is that instead of me carrying both kids home by Brompton (still totally possible) they wanted to ride their own bikes. Our son made it all the way to the lot. Our daughter made it about two blocks uphill before she lost the ability to climb any further on her little single-speed bike. We had expected this, so I had ridden the EdgeRunner. It only took a minute to pop her bike on the back and tow it once she gave up. Having both a boxbike and a longtail is awesome. It’s like having two minivans, with magical park-anywhere-and-avoid-all-traffic powers. This year, we got a seven foot tree. We don’t have to carry stuff by bicycle, of course. We have a car share membership, which my daughter announced to everyone in her kindergarten class during a field trip that passed by our house. 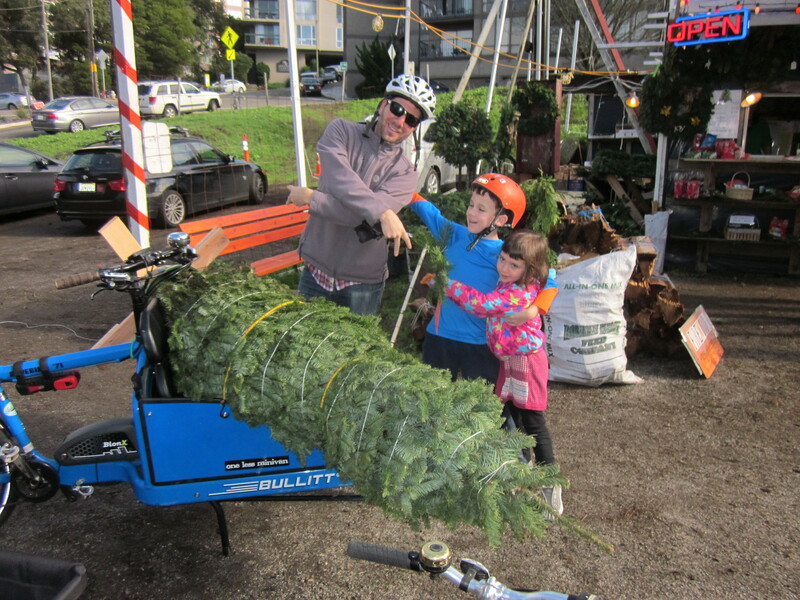 So our decision to haul the tree by bike is a choice—we could drive if we wanted to, but where’s the fun in that? Nonetheless, when we got to the lot we spotted some friends from kindergarten there, and they were very concerned that we wouldn’t be able to get the tree home. “Please, let us carry it home for you on our minivan,” they begged us. I couldn’t be more grateful that we have the kind of school community where people volunteer to help. Still, this was our fourth year in a row of carrying trees on bicycles. We’ve totally got this. There are people who’ve been hauling trees by bicycle longer, but it’s not a competition. Until next year, happy holidays! Another December means another trip to get a Christmas tree by bike. So far we have failed to match the experience of carrying a tree by bike that we had in the first year, which was laughably easy. Last year the tree fit in the bike just fine, but Matt dropped the Bullitt and lost one of the support struts holding up the rain canopy, which left the kids miserably cold until we got the new part. That meant the post-tree hauling experience was less than fun. So this year we switched back to the MinUte because I was paranoid about losing a support strut again, even assuming that we removed the canopy in the garage. It turns out that a midtail is great for a smaller tree, but a 7-foot tree with attached stand is a bit beyond the scope of our bike. Matt rode for part of the trip and walked the bike for part of it. The tree was firmly attached with bungees, but so back-heavy that the bike wanted to do wheelies. Maybe it would work if we were heavier riders. Next year, it’s back to the Bullitt (with an extremely careful removal of the canopy and full parts inventory before departure). However we did resurrect last year’s tradition of me riding the kids home on the Brompton. This was a bigger challenge than last year given that I’m not as strong as I used to be. For the last hill my son jumped off and walked with the tree-bike, so I was only carrying my daughter. Ultimately I made it up a decent hill on an unassisted bike with my daughter, who is now pushing 45 pounds, in the front seat. Not bad. 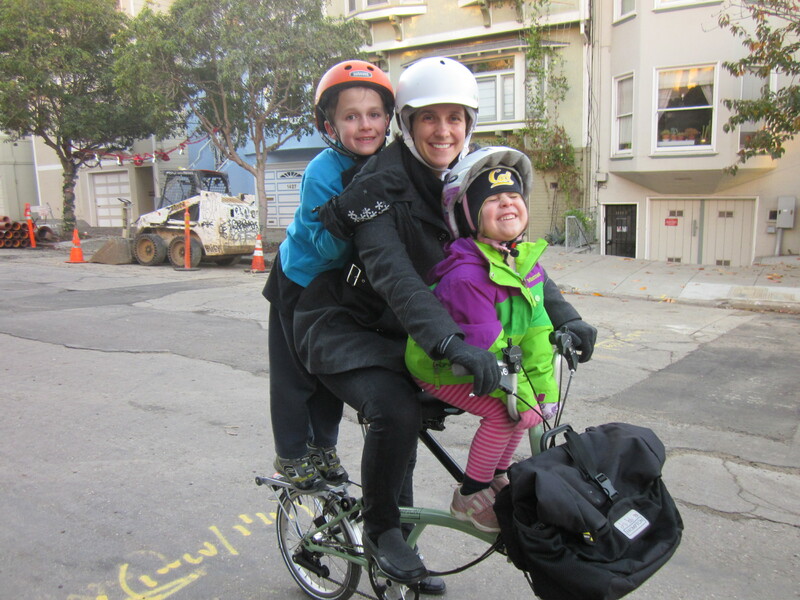 Although I tend to think bringing a tree home by bike is nothing special when I see all the cargo biking families who’ve posted pictures of themselves doing the same thing, it is evidently still pretty avant-garde here in San Francisco, because the lot manager recognized us from previous years. He did report that some families bring their tree home on scooters. And although our hauling strategy has not yet been perfected, it still beats waiting for one of the hotly contested spots in the parking lot and vacuuming a gazillion pine needles out of the car, an experience which historically made us reluctant to buy a tree at all. It is a big deal that we’ve now had some kind of tree three years in a row, as we’re (a) technically a Jewish family and (b) pretty lazy about the whole getting-stuff aspect of the holidays (my kids typically score socks for Christmas). In my defense, though, I always take the two weeks of school holidays off and spend gobs of time with the kids. 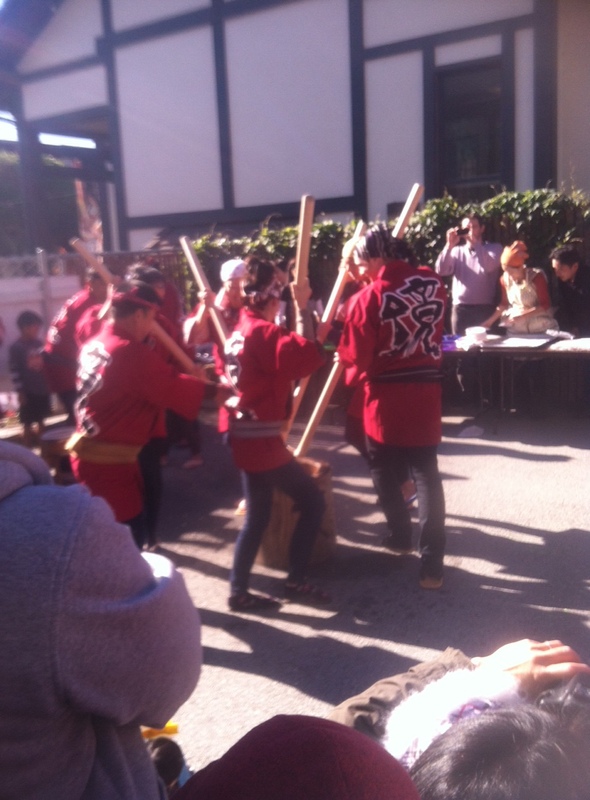 We need happi coats if we’re going to join the mochi pounding crew. On Sunday we went to our daughter’s preschool for a winter concert and mochitsuki, which was a bit early for a mochitsuki but pretty incredible nonetheless. Watching a pile of sushi rice turn into a gelatinous mass of delicious mochi is one of those have-to-see-it-to-believe-it experiences, plus we got to eat the mochi. My only complaint about the experience is that the bike parking around Japantown is pretty substandard. But evidently the car parking situation was worse, as a bunch of families arrived late. P.S. A zero-waste Christmas extra: my gift wrapping strategy. We are pretty mellow about the present-aspect of Christmas, but there are some gifts under the tree. One year my son even got a bike (the bike was left unwrapped). But most gifts are wrapped in fabric. Thanks to our exposure to Japanese culture, I picked up a few furoshiki in Japantown years ago to wrap gifts, and I reuse them every year. (For furoshiki wrapping techniques, ask the internet, which is almost as eager to teach people how to use furoshiki as it is to teach people how to wear scarves.) When I run out of furoshiki—I didn’t buy a lot because they are kind of pricey for something I use few times a year—I wrap gifts in my scarves or in our flour sack dish towels, which are free because we already own them. I know, know, dish towels: classy! But they are big and square and hey, white is a Christmas color. For larger gifts, I’ll use a pillowcase. And for huge presents, well, we have sheets and a fabric shower curtain. A watercolor pencil will write on fabric and come out in the wash, allowing the lazy wrapper to skip not only wrapping paper, tape, and ribbon, but a gift tag as well. Some people make their own furoshiki, or pick up square scarves while thrifting, but ever since I had the dish-towel insight I just can’t bring myself to make the effort. Presents for other people typically go out in a glass jar that would otherwise have been recycled, a flour sack dish towel that I wouldn’t be traumatized to never see again (they’re cheap), or some of my kids’ artwork (always my first choice, but not always available in appropriate sizes). Last year, we brought our Christmas tree home on the Kona MinUte. It was the easiest way to bring a tree home ever. Longtails and their midtail cousins are custom-made for the long skinny load. This year, to address some of my grouchiness about having the MinUte stolen, I decided I’d try to bring our tree home on the Brompton. Christmas tree by Bullitt: welcome home. Ambition, you have felled me again. We brought the tree home in the Bullitt. But the Brompton still had a surprise in store for us. Many San Francisco residents will know the significance of the numbers 7 and 49. San Francisco is seven miles by seven miles square, and thus 49 square miles. San Francisco also came into its own as a city in 1849 with the Gold Rush. Thus the city is littered with references to both numbers: 49-mile drive, the 49ers, not to mention a vapid lifestyle magazine, 7×7 (which once referenced the city’s geography but now apparently alludes to days of the week). Anyway, I became very excited when I realized that this year I had both a seven year old and an opportunity to carry a seven foot tall Christmas tree. Surely this was meant to be! 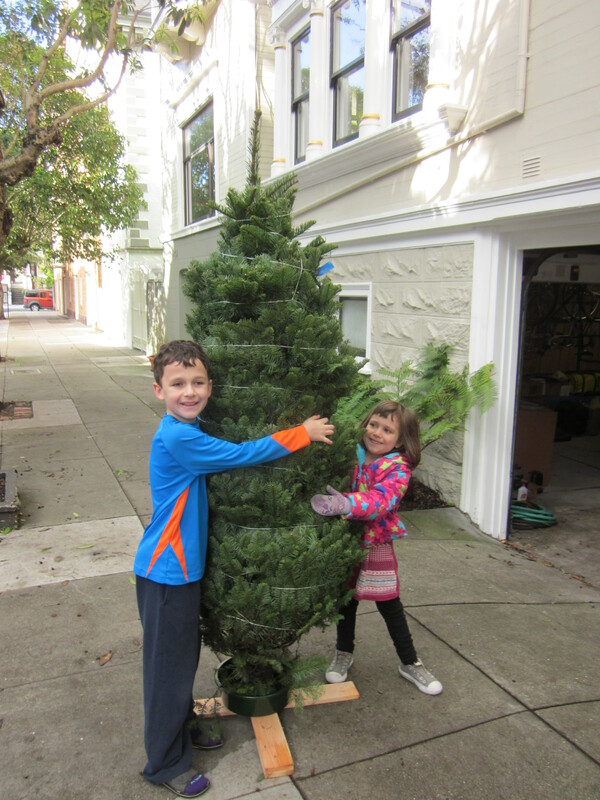 Once again, my son found a tree and stood yelling, “This one!” as two other families were walking over talking about taking it home themselves, and once again a couple of other people made a move on our tree as the packing guys were wrapping it up. His ability to find the best tree on the lot is uncanny. Trying to carry both him and it on the Brompton, however, was a mistake. 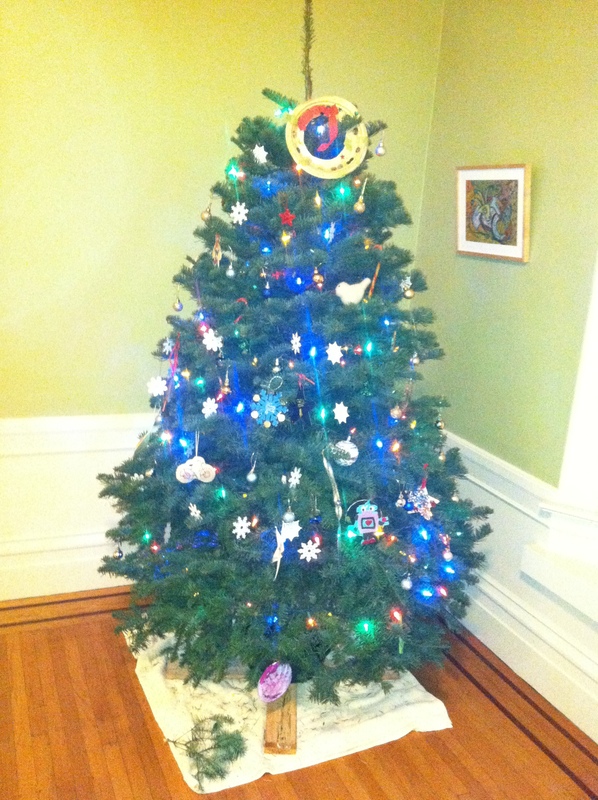 If we’d gotten a smaller tree it TOTALLY WOULD HAVE WORKED. Based on my test run with a load of lumber, I could almost certainly have carried a 4-5 foot tall tree standing up on the rear rack, with the center of the tree bungeed to the saddle rails (here’s proof). More than that height, though, and it was too top-heavy. We couldn’t keep the tree from toppling over just walking it across the Christmas tree lot. Oh well, that’s why we brought the real cargo bike. We had a backup plan. Almost there, but note a crucial handlebar mistake on the left. So we plopped the tree on the Bullitt, bungeed it down (the Bullitt has many handy bolts to bungee things to) and put our son in the bulldog seat over the top tube. Hey, 7×7 after all! Unfortunately this setup lasted less than a block. We’d inadvertently put the tree stand too close to the handlebars, and when Matt tried to make the first turn, he hit it and dumped the bike. I have this disgraceful moment on video, but will never post it. It took less than a minute to rearrange the tree, but our son pretty understandably refused to get back on the Bullitt after that. 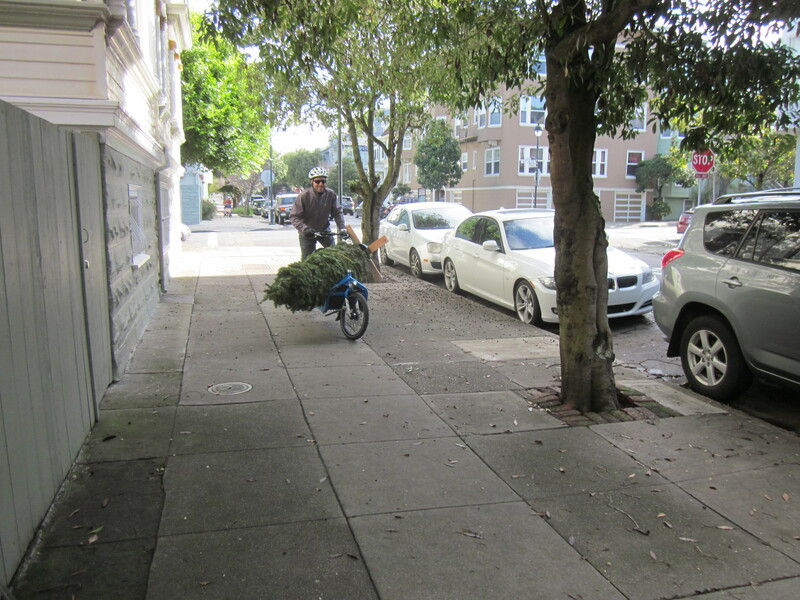 So Matt headed off again with just the tree on the Bullitt, drawing accolades from all and sundry, including a man walking by who stuttered, “That is… so cool! It’s like green… on green!” Honestly, you’d think these people had never seen someone carry a Christmas tree home by bike before. Yep, that’s two kids on one Brompton bicycle. We are our own clown car. We were laughing all the way, ho ho ho, even on the uphill parts. Admittedly the trip was less than a mile. I realize that I have probably voided every warranty that the manufacturer offers on this bike based on my son’s weight alone; but I would totally do it again. It was really, really fun. So last Christmas: tree by bike. This Christmas: tree by bike and three people on a Brompton. Next year, well, no idea yet, but I’m open to suggestions. In the meantime, anyone can follow along with tree-hauling-by-bike exploits around the world by following the hashtag #ChristmasFeats on Twitter. Happy holidays!